The term “mushroom” actually refers to the reproductive portion of a fungus which grows up from an underground myce-lium, i.e. mass of filaments or hyphae constituting the vegetativeportion of the fungus. The term “mushroom” actually refers to the reproductive portion of a fungus which grows up from an underground myce-lium, i.e. mass of filaments or hyphae constituting the vegetativeportion of the fungus. Of the numerous species of mushrooms, less than 5% are poisonous, while many are edible and are very popular in Western and Chinese cuisine. All toxic mushrooms belong to two divisions: Basidiomycetes and Ascomycetes. The important parts of a poisonous mushroom (careful examination of which can help in identification) include the pileus (cap), stipe (stem or stalk), lamellae (gills), volva, veil, annulus (ring), and spores (Fig 33.1). Pileus refers to the broad, cap-like structure from the undersurface of which hang the gills or lamellae. The latter radiate out like the spokes of a wheel. Spores are located on the lamellae, and are microscopic reproductive structures which are produced in the millions and range in colour from white to black, with shades of pink, brown, and purple in between. Stipe is the stalk or stem supporting the pileus. The annulus (“ring of death”) is a ring-like structure that surrounds the stipe below its junction with the pileus. The veil is a membrane that completely or partially covers the lamellae. Volva (“death cup”) represents the remnant of the veil foundaround the base of the stipe in some species. The common names of important mushrooms are listed in Table 33.6. · Galerina species comprising G. autumnalis, G. marginata,G. sulcipes, and G. venenata. · Lepiota species comprising L. castanea, L. helveola, L. chlorophyllum, L. josserandii, L. subincarnata, and L. brunneoincarnata. Amatoxins, phallotoxins, and virotoxins, which are all cyclopeptides. * Nine amatoxins have been identified: alpha, beta, gamma, and epsilon amanitins, amanullin, amanullinic acid, proamanullin and amanin. Amanitins are the most toxic compounds. Phallotoxins are bicyclic heptapeptides. Seven compounds have been identified: phalloidin, phalloin, prophal-loin, phallisin, phallacin, phallacidin, and phallisacin. Five virotoxins (monocyclic heptapeptides) have been isolated from Amanita virosa (Fig 33.3). Mushrooms belonging to this group have no characteristic taste or smell. The colour varies with the climate, soil, and age of the mushroom. Identification is based on the presence of white gills underneath the cap, an annulus at the top of the stalk, and a volva at its base. Specimens cut off at ground level may be misidentified. The swollen base is seen only when the entire fruiting body is dug out of the ground. Of all the toxins, phalloidin appears to be the most rapid acting, while amanitin causes more delayed manifestations. Phalloidin interrupts actin polymerisation and impairs cell membrane function, but has a limited absorption and therefore toxicity. Phalloidin binds to the actin F (filamentous polymer) of the plasma membranes, and hence increases the perme-ability of the plasma membranes of hepatocytes. Amatoxins are more potent and can cause substantial hepatic, renal, and CNS damage. In vitro studies indicate that alpha-amanitin is cytotoxic on the basis of its interference with RNA polymerase II, preventing the transcription of DNA. Target organs are those with the highest rate of cell turnover—GI tract epithelium, liver hepatocytes, and kidneys. Cells with the highest rate of multiplication, such as the intestinal mucosa, are injured first, followed by the liver and kidneys. There is often a latent period of 6 to 24 hours following inges-tion. The toxins are not destroyed by cooking. Abdominal pain, nausea, vomiting, diarrhoea fever, tachycardia, hypoglycaemia, hypotension and electro-lyte imbalance, lasting for about a day. The diarrhoea is often severe, watery, and cholera-like (up to 2 to 4 litres/day). · Metabolic acidosis may occur. · Treacherous phase of remission, during whichthe patient may be considered to have recovered and may even be sent home, only to return moribund soon thereafter. · Two to three days after ingestion of the toxic mush-room, the third devastating phase unfolds leading to hepatic, renal, and (occasionally) pancreatic failure. Hepatotoxicity manifests in the form of elevations of AST, ALT, and bilirubin levels, hypoglycaemia, jaundice (Fig 33.4), encephalopathy with convulsions, coma, and death in 7 to 10 days (after ingestion). In most cases, encephalopathy occurs 5 to 7 days after ingestion. Coagulation defects with hypofibrinoge-naemia and hypoprothrombinaemia occur in hepatic failure, and may result in local or general bleeding. Fulminant hepatic failure, developing very quickly, and requiring liver transplantation has been reported following severe intoxications. Lactic acidosis and metabolic acidosis have also been reported in the 3rd phase. · Hypoglycaemia is a grave marker signifying poor prognosis. Spontaneous hypoglycaemia results from impaired glycogenolysis and gluconeogenesis. Insulin and C-peptide concentrations are elevated in many patients. Amanita toxins appear to be able to induce a direct insulin-releasing effect, and also have a cytotoxic effect on beta cells. Some investigators suggest that aminotransferases are important biological markers, and advocate that monitoring transaminases and measuring their ratio may be of prognostic value. But the general consensus is that prothrombin time is a more useful prognostic marker for clinical outcome than serum aminotransferase levels, although close monitoring of both are recommended. · Cardiovascular collapse usually accompanies severe hepatic failure at the terminal stage. Sequelae which may follow include cardiomyopathy, coagulopathy, and seizures. When liver damage is reversible, patients usually make a slow and steady recovery. · Adult respiratory distress syndrome (ARDS) may develop in the later stages of cyclopeptide mushroom poisoning, in conjunction with severe hepatic impair-ment and coagulopathies. ARDS resulting in death has been reported. · Polyneuropathy, developing several days after mush-room ingestion, has been reported in some patients. Manifestations included the following: loss of strength in the lower extremities, absence of deep tendon reflexes, and alteration of pain, temperature and proprioceptive sensitivity. 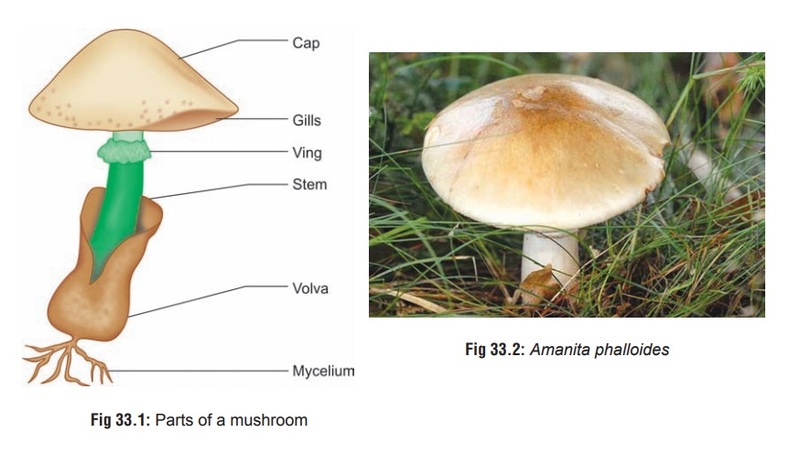 · Two kinds of renal failure are observed in Amanita poisoning. During the gastrointestinal phase, a func-tional renal failure is frequently observed, which is characterised by hypovolaemia, and is secondary to fluid losses and hypoperfusion of the kidneys. Acute renal failure with anuria occurs in the third phase of poisoning, and may be accompanied by severe hepatitis with hepatic coma and haemorrhages. This is part of the hepatorenal syndrome. · In pregnancy, the foetus may develop a toxic hepatitis. Since it is unclear whether amatoxins are excreted in breast milk, breastfeeding must not be allowed as far as possible. · About 2 to 3 mushrooms (A. phalloides). · Concentrations of 5 to 15 mg of amatoxins per gram of dried mushroom have been found, which is equivalent to mg/kg of amatoxin may be a lethal dose for human adults. · About 15 to 20 Galerina caps could kill a healthy adult, as will about 30 Lepiotas. · The Meixner test, a simple colourimetric spot test for detection of amatoxin, unfortunately gives false-positive reactions with samples containing psilocybin and 5-substituted tryptamines. Therefore, the test has limited clinical utility. Further, a negative reading is not neces-sarily indicative that a mushroom is safe; potential toxicity following ingestion may still exist. · Melzer’s test can be done to detect an amyloid reaction in cyclopeptide containing Amanitas. · Hepatic and renal function tests. · Serum electrolytes, urea, creatinine, and glucose levels. o A drop of material, placed on a slide and covered with a cover slip may, under high power (450X–500X) magnification, reveal spores mixed with the debris of the sample. o Spores will be fairly uniform in size and shaped some-what like an apple seed or popcorn kernel. They are about the size of a red blood cell (approximately 7 microns). Amanita spores are hyaline, thin-walled, and without a pore. Spores of less toxic species are thick-walled with a pore. Dark-coloured spores indicate a genus other than Amanita. –– Filter the sample through four layers of cheesecloth using water to emulsify if necessary. –– Centrifuge the filtrate at 7000xg for ten minutes to sediment the spores. –– Remove the supernatant carefully utilising suction or pipette. –– Re-suspend the pellet of sediment in one to two drops of water. -- Place a drop of the sediment suspension on a slide. -- Heat gently to evaporate the liquid and fix the material to the slide. -- Add acid fuchsin (1% acid fuchsin in distilled water). --Wash off excess stain gently with water. --Examine as described above. The spore walls will appear vivid red in contrast to the amor-phous debris. · Detection of toxins in gastric aspirate, serum, urine, stool, and liver and kidney biopsies, using HPLC, TLC, or RIA. · Monitor coagulation parameters (INR or PT), especially the clotting factors synthesised by the liver, i.e. fibrinogen, prothrombin. · Elevated AST, ALT, LDH, and serum bilirubin are the earliest and best indicators of liver damage, while glucose, fibrinogen, and prothrombin time are the best indica-tors of established hepatocellular failure. Patients with prothrombin values less than 10% have high fatality rate. Grade 1: GI upset, no indications of liver or kidney failure. Symptomatic treatment only. Grade 2: All signs of intoxication, with a mild to moderate rise in transaminases (less than 500 units/L). Symptomatic treatment only. Grade 3a: Bilirubin rise is mild or absent. Grade 3b: Bilirubin rise is steep and continuous (> 5 mg/ dL). These patients are at risk and should be transferred to a facility where liver transplant is possible. Grade 4: Steep rise in transaminases, accompanied by a steep decline in clotting function, a steep rise in bilirubin, and the onset of kidney dysfunction. These patients have a poor prognosis, and many die in spite of intensive care. · Restoration of fluid and electrolyte balance: vigorous and immediate correction of dehydration and hypovol-aemia. · IV glucose: Monitor serum glucose levels hourly at the bedside. Give intravenous solutions of 10% dextrose by continuous infusion, and additional boluses of glucose as indicated by the tests. · Monitor coagulation tests (prothrombin and fibrinogen) frequently. If hypoprothrombinaemia and hypofi-brinogenaemia or clinical haemorrhage is present, give vitamin K (50 to 100 mg/day IV) and fresh frozen plasma. · Correction of hypokalaemia (by potassium chloride diluted in solutions of dextrose 5%, or NaCl 0.9%), and of metabolic acidosis (by sodium bicarbonate solution 1.4%) should be guided by repeated laboratory analyses. · Activated charcoal in the usual manner. Multiple dose activated charcoal is recommended by some the enterohepatic circulation of the amatoxins. Emesis and catharsis are usually unnecessary. · Toxicokinetic studies indicate that significant amounts of amatoxins are eliminated in urine, especially during the first 48 hours following ingestion. Forced diuresis (6 to 9 L/day) may therefore help if the patient is seen within 24 to 48 hours. However it has not been proven to be really effective. · Haemoperfusion is said to be beneficial if performed within 24 hours of ingestion. A major risk of haemoperfu- sion is thrombocytopenia with increased risk of bleeding. · Plasma exchange has been tried without conclusive evidence of benefit.Charcoal plasmaperfusion (CPP) and continuous venovenous haemofiltration (CVVH) have been tried successfully in a few cases. · The current view is that because amatoxins are cleared rapidly from the plasma by the kidneys, extracorporeal elimination techniques are not likely to clear significant amounts of toxin. Haemodialysis or haemoperfusion may be indicated only if a patient with previous renalfailure develops Amanita intoxication. · Benzyl penicillin at a dose of 300,000 to 1,000,000 units per day is said to be effective in displacing amatoxin from plasma protein-binding sites allowing for increased renal excretion. Some investigators dispute this. · Thioctic acid (alpha-lipoic acid) was initially thought to be beneficial in the treatment of hepatic damage, but subsequent studies have been discouraging. · Silybinin (an extract of silymarin from the milk thistle Silybum marianum) is being investigated for its reported beneficial effects in countering hepatotoxicity, but there is no evidence so far of clear-cut advantage. Cimetidine (a potent cytochrome P450 system inhibitor) may have hepatoprotective effects against alpha- amanitin, and is suggested by some investigators as a therapeutic intervention at a dose of 4 to 6 gm/day. · N-acetylcysteine (NAC) has been investigated in some patients with various degrees of amanita poisoning. · NAC therapy was started early, during the gastrointes- tinal phase of illness, and the doses used were suggested by the treatment of paracetamol poisoning. Additional treatment also included the use of haemodiaperfusion, high dose penicillin, and supportive care. Many of the patients were said to have benefited. The root of the Indian plant Picrorhiza kurroa contains an iridoid glycoside mixture that has been shown to be hepatoprotective in certain situations. Kutkin is a mixture of the iridoid glycosides picroside 1 and kutko- side. When mice were given lethal doses of lyophilised Amanita phalloides, the protective effect of kutkin was comparable to that seen with silibinin. · Aucubin is an iridoid glycoside obtained from the leaves of Aucuba japonica. It has been shown to be protective against Amanita intoxication when tested in dogs. · General principles— –– Hospital admission. –– Invasive monitoring to detect complications before they become clinically evident. –– Placement of CVP monitor, arterial line, urinary catheter, and nasogastric tube. –– Endotracheal intubation if patient is comatose. –– Continuous pulse oximetry. –– Mechanical ventilation, if there is evidence of hypercapnia or hypoxia. –– Prevention of hypoglycaemia by continuous infu-sion of 5 or 10% dextrose. –– If hypoglycaemia develops, infuse 50% dextrose. –– Treatment of hypotension with crystalloid or colloid solutions, or drugs such as dopamine, noradrena-line, etc. –– Treatment of renal failure with dialysis or arterio-venous ultrafiltration. –– Prevention of gastroduodenal bleeding with regular doses of H2 antagonists or omeprazole. –– Dietary protein withdrawal. –– Metronidazole or neomycin. Treatment of cerebral oedema— –– ICP monitoring. –– Osmotic diuretics such as mannitol (1 gm/kg, as rapid IV infusion of 20% solution). This is repeated whenever ICP rises above 30 mmHg for 5 minutes or more. Plasma osmolarity must not exceed 320 mOsm. –– Barbiturates such as IV thiopentone (3 to 5 mg/ kg) infused slowly over 15 minutes until signs of raised ICP resolve, or a maximum of 500 mg has been administered. –– Proper positioning of the patient, i.e. head upright (with the head no higher than 30° from the hori-zontal). –– Corticosteroids may not help in relieving cerebral oedema due to acute liver failure. · Treatment of infection—Some investigators are of the opinion that prophylactic antibiotic therapy is vital to the treatment of acute liver failure. In any case, aggres-sive daily microbiologic surveillance is essential. · Treatment of coagulopathy—Fresh frozen plasma is necessary if there is evidence of serious or persistent bleeding. –– Grade II encephalopathy and beyond. –– Prolonged prothrombin time (greater than two times normal), despite administration of fresh-frozen plasma. –– Serum bilirubin greater than 25 mg%. –– Azotaemia. –– Evidence of acidosis, hypoglycaemia, GI haemor-rhage and hypofibrinogenaemia. · Molecular Absorbent Regenerating System (MARS)— MARS is a method of removing protein bound substances in patients with liver failure and hepatic encephalopathy. It employs an albumin-impregnated highly permeable dialyser with albumin-containing dialysate recycled in a closed loop with a charcoal cartridge, an anion exchange resin absorber, and a conventional haemodialysis membrane. It has been used in a small number of patients with fulminant hepatic failure secondary to cyclopeptide mushroom ingestion. MARS appears to be a promising bridging technique until the patient’s liver can spontaneously recover, or until liver transplantation can occur. However, there are no clinical studies comparing the survival rates of patients treated with MARS and those receiving supportive care. · Never eat wild mushrooms obtained by foraging in the countryside unless the identity can be confirmed by an experienced mycologist. Distinguishing edible from toxic mushrooms is extremely difficult, regardless of what some foragers may claim. · Even edible mushrooms can become toxic if allowed to go stale. Therefore, only fresh specimens should be eaten. · Most toxic mushrooms resemble edible mushrooms at some stage of their growth. Even careful examination may not help in conclusively identifying a mushroom as non-toxic. · Some tests such as Meixner test or Melzer’s test may be of help. · Susceptibility to the toxicity of a poisonous mushroom varies from individual to individual, some demonstrating evidence of severe poisoning, while others do not. · There are a number of myths associated with mushrooms bandied about as facts by self-professed “experts”, which must be disregarded. · Some species of mushroom may be edible in a particular geographical area, while in another location they may be toxic (“Jekyll & Hyde mushrooms”). · Some mushrooms are toxic only if they are consumed along with alcohol. · Mushrooms must always be well cooked, and never eaten raw. · As a general rule, it must be remembered that the following kinds of mushrooms are potentially toxic: pure white mush-rooms, little brown mushrooms, large brown mushrooms, and red or pink-pored boletes. · Mushroom poisoning has always been rare in this counry, but there are indications of rising incidence with increasing popularity of Western and Chinese cuisine. Most cases result from consuming wild mushrooms obtained by rural folk and nomads foraging in woods and the countryside. Farm grown mushrooms are usually safe. More than 90% of the reported cases of mushroom poisoning are due to A. phalloides, and the Amanita genus alone accounts foralmost all the fatalities. · In the West, hallucinogenic mushrooms (“magic mush- rooms”) such as those of Psilocybe genus have become part of the drug culture. There are even mail-order kits of the spores of such mushrooms that can be employed to cultivate “magic mushrooms” at home. · In conclusion, it must be emphasised that incidents of mush- room poisoning do not constitute a recent phenomenon, buthave existed since ancient times. · Autopsy features in a mushroom-related death may revealjaundice, hepatomegaly or hepatic necrosis (Fig 33.5), andhaemorrhages on the surface of the heart (Fig 33.6).